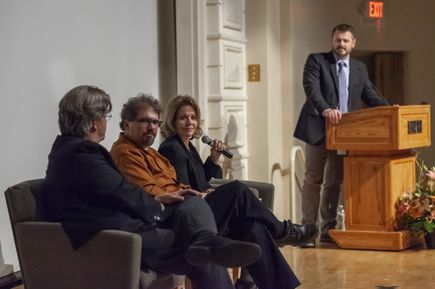 Internationally renowned opera singer Renée Fleming brought a straightforward message to a full house in the OHSU Auditorium: You don’t have to be Grammy winner for your brain to reap the benefits of music. Fleming, visiting Portland to perform with the Oregon Symphony Sunday, first detoured to OHSU’s Marquam Hill campus to deliver a presentation called “Music and the Mind.” As part of a partnership between the National Institutes of Health and the John F. Kennedy Center for Performing Arts, Fleming’s presentation lays out the ways in which listening, performing or creating music can improve brain health. “Nothing else does that,” she said. In an on-stage discussion with Fleming following her presentation, OHSU neuroscientists cited a growing field of research exploring the importance of music for brain development and healing. Marc Freeman, Ph.D., research scientist and director of OHSU’s Vollum Institute, which pursues basic scientific research into how the brain works at a molecular level, moderated the discussion. He was joined by Larry Sherman, Ph.D., a professor in the Division of Neuroscience at the Oregon National Primate Research Center at OHSU who studies neurodegenerative conditions, and Erick Gallun, Ph.D., an associate professor of otolaryngology/head and neck surgery in the OHSU School of Medicine. Gallun also works with the Portland VA Health System, where he specializes in the connection between the ear and the brain. During the discussion, Fleming said one of the latest iterations of music therapy involves forming drumming circles for people struggling with addiction. Gallun suggested the technique may be soothing because the drumming echoes a rhythm from the earliest possible point of the brain’s development. Sherman, a musician in his own right, has performed a series of popular talks exploring how listening and practicing music can influence brain development and forestall cognitive decline in aging. He said the soaring feeling of inspiration that occurs when we’re playing, singing or listening to music is rooted in brain chemistry. Magnetic resonance imaging shows a spike in endorphins and in dopamine among people exposed to music, which generates a feeling of belonging and of community. Sherman said this effect is especially pronounced in bigger groups. Fleming recently spent two hours laying in an MRI machine as part of an NIH-supported Sound Health initiative to study the specific neural circuits involved in the interaction between music and the brain. Through functional MRI imaging, scientists are learning patterns of activity involved in a series of discrete actions like speaking, listening or reading. Fleming showed one set of striking slides showing MRI images lighting up whole regions in the brain among people exposed to music. 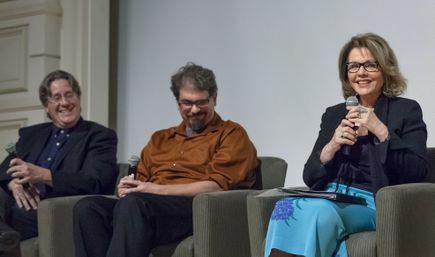 During the question-and-answer discussion, several teachers thanked Fleming for raising public awareness about the link between music and brain development for young people. Fleming, in turn, thanked the teachers. In fact, she highlighted the work of the Bravo Youth Orchestra, which delivers intensive orchestral music instruction to underserved populations. Later, Fleming gathered for pictures with the Bravo orchestra, which performed in the Auditorium entryway. “Music can really make a difference in their lives,” she said. 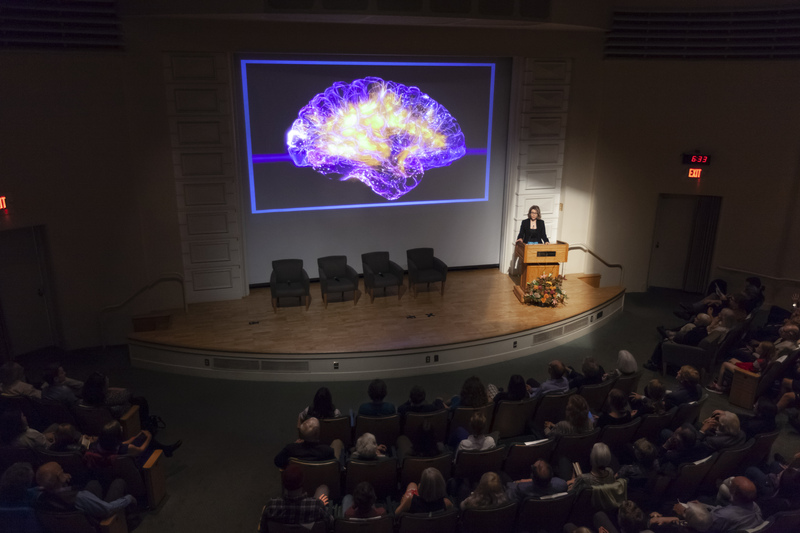 Afterwards, Freeman said he was gratified by the turnout and credited Fleming with elevating public interest in neuroscience.